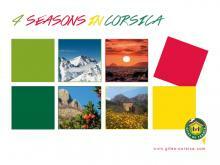 Corsica self-catering accommodation: where to stay on the GR20 cross-Corsica long distance footpath! Planning to hike the GR20 long-distance footpath across the island of Corsica? Gites Corsica is the place to book Corsica self-catering accommodation for groups, families, couples and individual hikers. Fifteen days are what it takes to walk the GR20 long distance footpath, along a legendary route considered one of the most challenging in Europe. Breathe in the amazingly pure air and let your eyes wander over faraway vistas. But remember, the more arduous the way, the better rest you need overnight. So our Corsica self-catering accommodation is just the thing! Slip off your backpack, put up your feet and enjoy a comfortable stopover in a gite d’étape, designed for groups and individuals looking for simple, yet quality-assured overnight accommodation. As you plan your journey on the GR20 long distance footpath, just a few clicks is all it takes to find the ideal Corsica self-catering accommodation that will welcome you and your companions as you wend your way across the island.